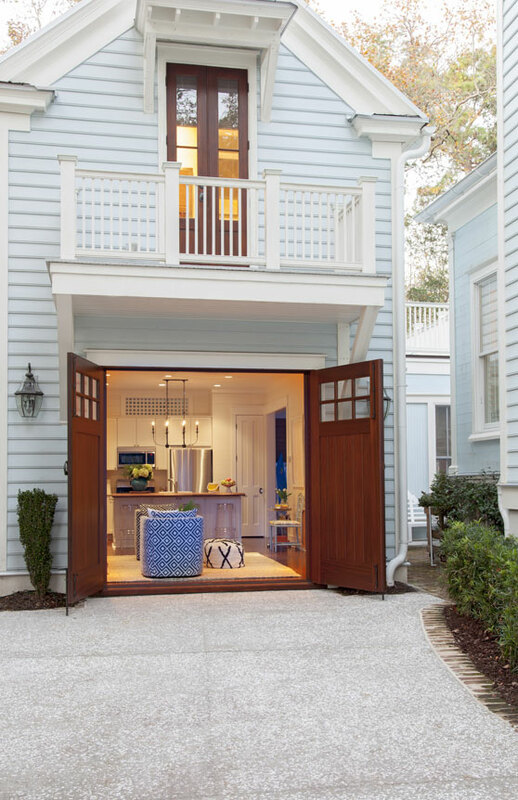 Double the Fun: Twin front porches function as outdoor rooms; they also remind the Elebashes of the Colonial Caribbean architecture in St. Kitts. 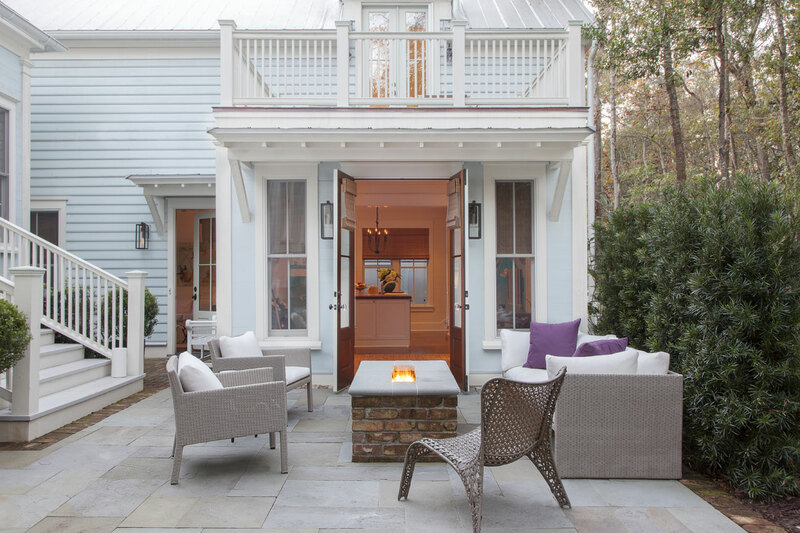 Guest Star: A courtyard connects the main abode to this 1,100-square-foot carriage house. 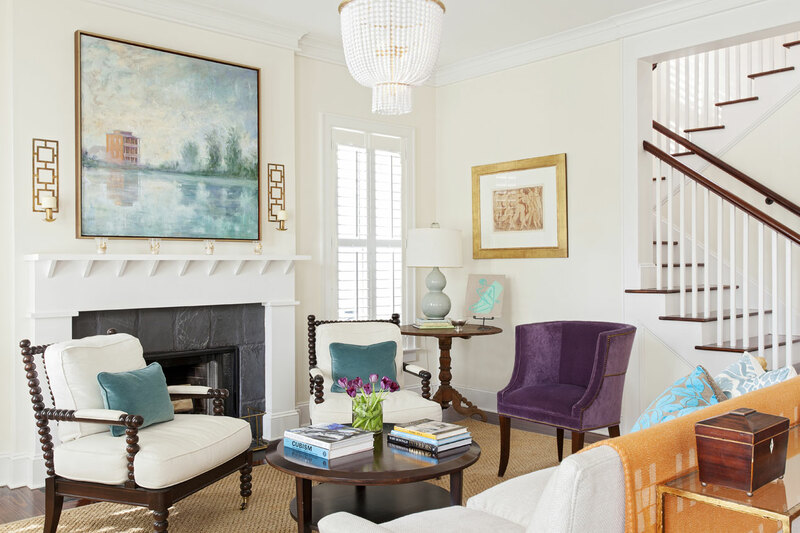 In the living room, a woven rug, creamy white walls, and neutral upholstered pieces contrast nicely with an orange throw, a violet velvet chair, and a blue-hued Linda Fantuzzo painting depicting I’On a decade ago. 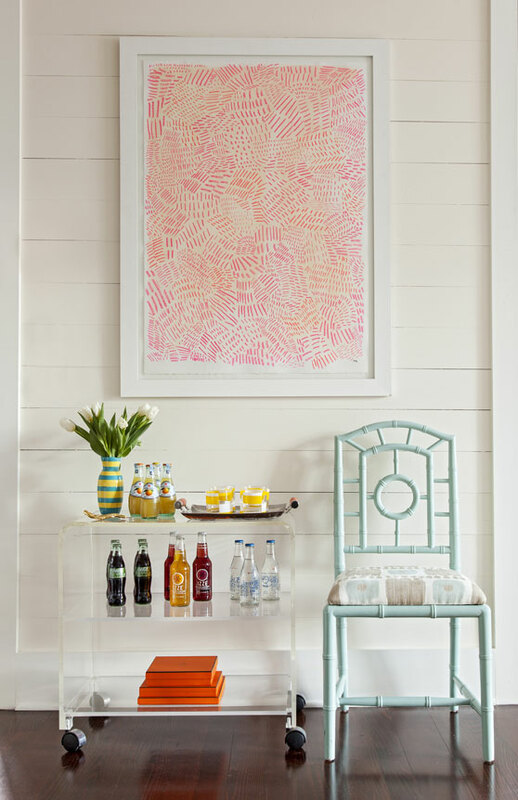 A work by Sally King Benedict helps the mini bar stand out visually against a neutral wall. Inspired by views of the adjacent nature preserve, Allison used vibrant green fabrics to upholster a headboard and bench for the master bedroom. 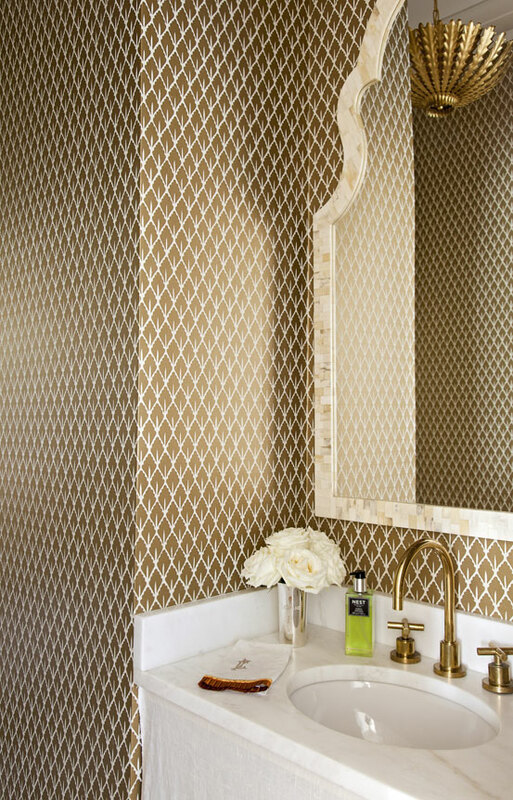 In this petite powder room, Schumacher wallpaper makes a bold statement without overwhelming the eye. 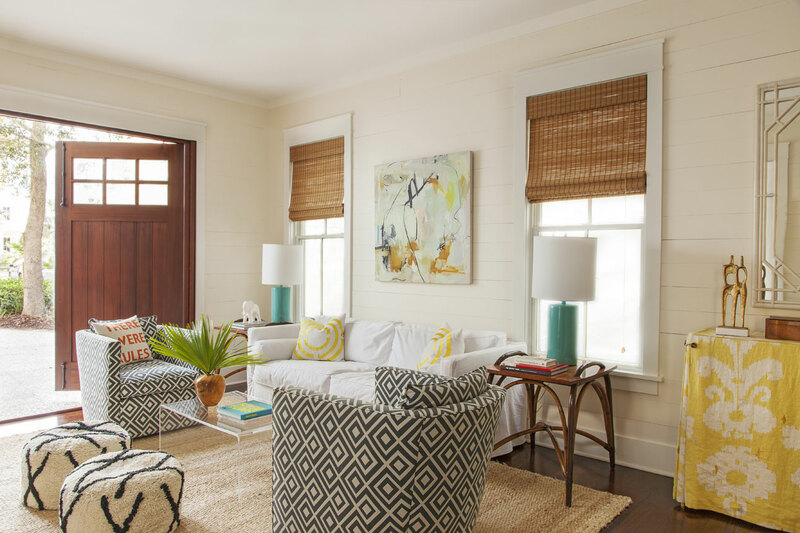 Hang Loose: Allison curated a more casual vibe in the guest house by freely mixing patterns and colors. A painting by Sally King Benedict ties the look together. Barn doors open onto the patio, making the outdoor space feel like a natural extension of the interiors. 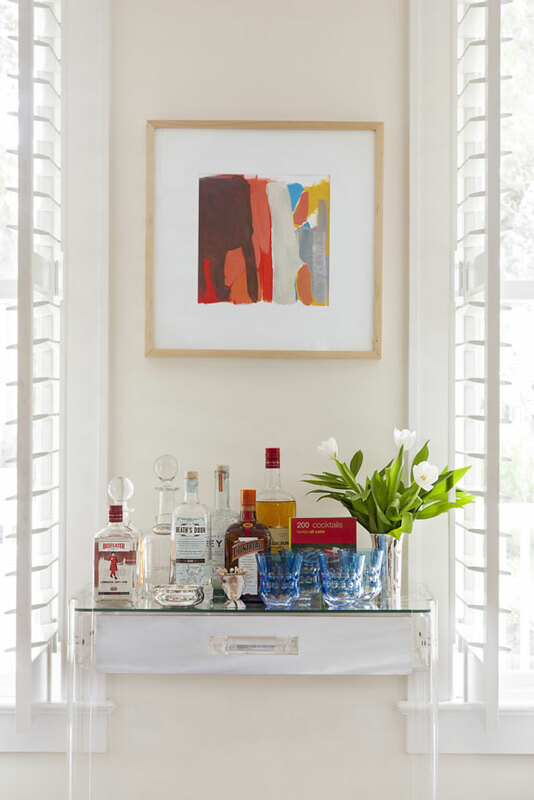 Allison scored this acrylic bar cart at Fritz-Porter, a favorite local design source. Hot Spot: Boasting a gas fireplace and stunning woodland views, the rear courtyard is the family’s favorite place to hang out. For Allison and LeGrand Elebash, home isn’t something that can be contained within four walls. Rather, it transcends brick-and-mortar boundaries, edging into the territory of sky, sun, and breeze. 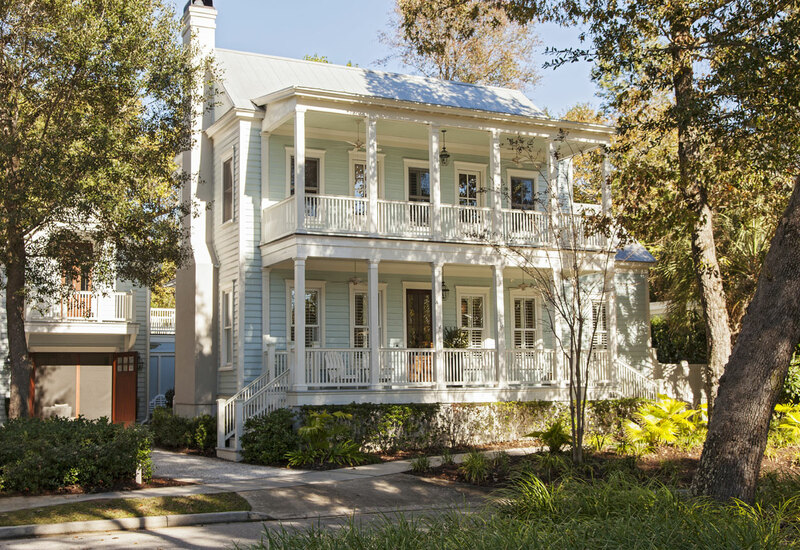 At the duo’s abode in Mount Pleasant’s I’On neighborhood, it spills out onto the double front porches where their 15-year-old daughter Chloe can frequently be found relaxing or studying in her Eno hammock. It also flows out back onto the bluestone patio, where the couple often greets the day with cups of Nespresso, complemented by long views of the protected wildlife refuge that borders the rear of the property. And for a treat, after supper, it draws the whole gang—including 17-year-old Hudson, when he’s home from prep school—out under the stars to roast marshmallows around the gas fireplace that, with the touch of a button, blazes to life in the center of the rear courtyard. 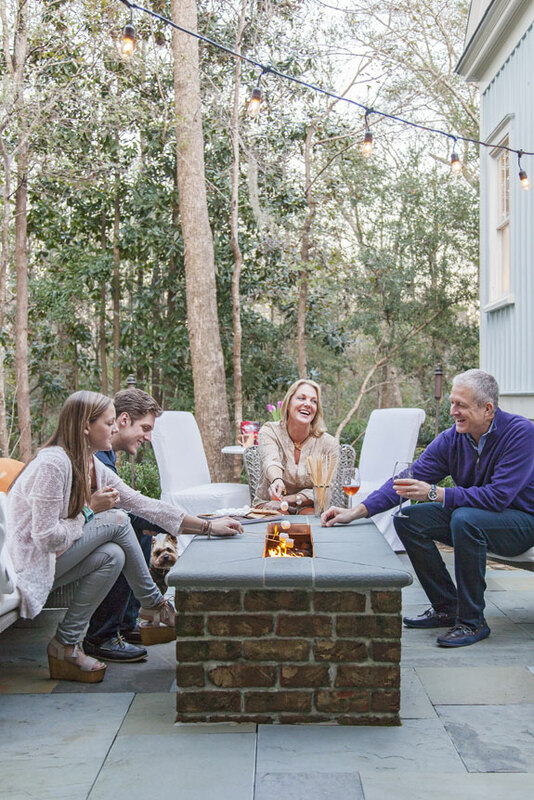 Reggae music flows from hidden outdoor speakers and, with the marshmallows being folded into s’mores and Bob Marley insisting that “every little thing is gonna be alright,” it’s hard to imagine a more pleasing way to pass a Lowcountry evening. Clearly, this crew has mastered the art of outdoor living. 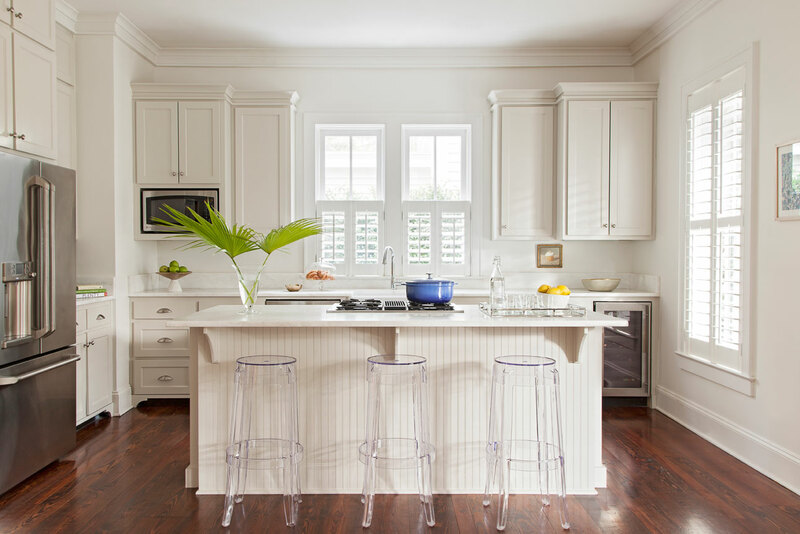 Their laid-back, bring-the-inside-out approach is informed by a four-year stint in St. Kitts, where the tropical climate fosters a culture of open windows and outdoor rooms. They never planned to be islanders; in 2008, the Elebashes had already put down roots in Mount Pleasant—and once owned a different home in I’On. But later that year, LeGrand, a Charleston-born real-estate developer, was enlisted to help launch Christophe Harbour, a luxury resort community in St. Kitts birthed by the former owners of Kiawah. Soon after, Allison, an interior designer who’d just launched her own firm, was tapped to do design work for the burgeoning hamlet. And so, the adventurous couple decided to take a leap of faith, trading their Charleston address for a Caribbean one. The move proved to be a life-shaping experience. For one thing, it reinforced Allison and LeGrand’s natural inclination to blur the lines between indoors and out. 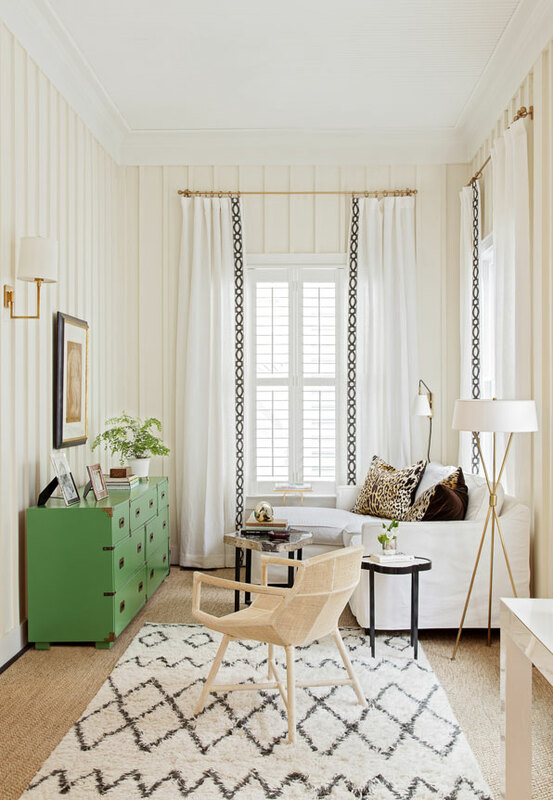 The duo had always enjoyed spending time under the sun, even outfitting their first Charleston pad with a rooftop deck. “But in St. Kitts, we really lived outside, with the doors open all the time,” Allison says. The tropical environment also helped to shape Allison’s design aesthetic. “In the Caribbean, you are surrounded by the use of bold colors,” she notes. “Moving there, I was inspired to take more risks with vibrant hues as well as blending colors and patterns.” Still, as their family matured and Hudson started spending part of the year at a boarding school in New England, the crew began to crave a return to the States. In 2012, they charted a move back to the Holy City, knowing just where to drop anchor: their old neighborhood of I’On. “When we couldn’t find anything to buy that we loved, we decided to rent,” explains Allison. After two years in the 2,700-square-foot main house, the Elebashes fell in love with the property and bought it, knowing it jived with the way they wanted to live. Still, there were a few projects to tackle in order to make the house feel like home. First, the couple had to pare down their belongings, as their previous residence was roughly twice the square footage of the new digs—and for the Elebashes, downsizing led to unexpected boons. The smaller scale inspired smart efficiency measures, including custom storage solutions that take advantage of every nook and cranny of closet space. And the pruning process forced them to curate a well-edited collection of furnishings and décor. “The pieces we do have now, we really love,” Allison explains. 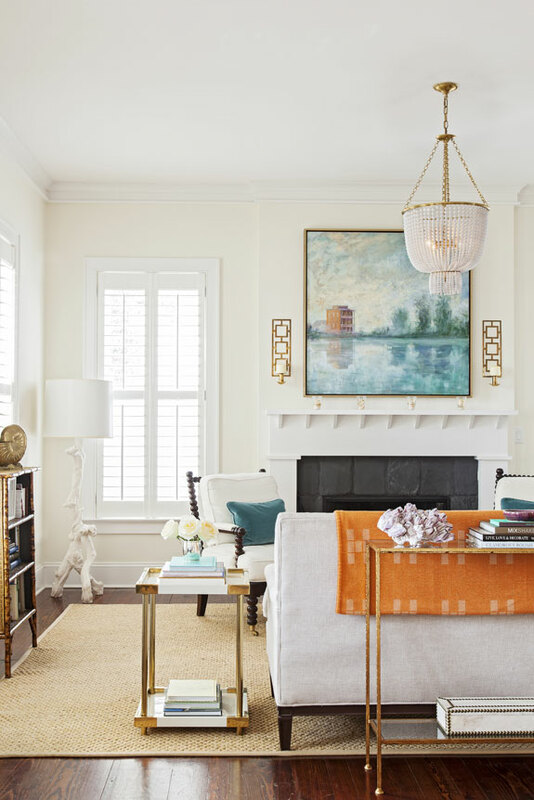 This stripped-down approach means that cherished items—such as the Linda Fantuzzo painting that presides over the living room and the lacquered green bureau that adds vibrancy to the den—really shine. And, against an uncluttered backdrop, strategic doses of color make a big impact. 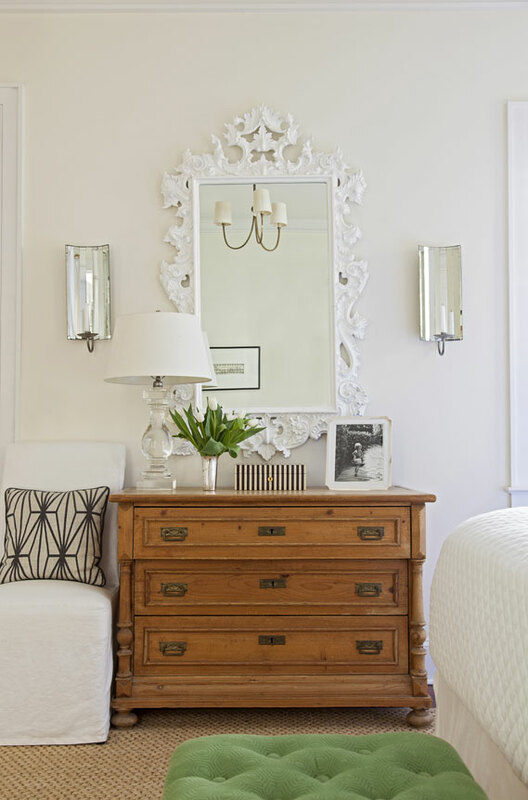 In the master bedroom, for example, grassy-green upholstery on the headboard and bench pull the landscape inside. “It’s bright and cheery and makes you feel happy when you walk into the room,” Allison adds. With the interiors thus appointed, Allison and LeGrand turned their attention to the backyard, where they aimed to transform the underutilized courtyard into an oasis equally suited for cocktail parties and communing with nature. “We were challenged because we didn’t have a lot of space to work with and we wanted the design to blend in with the surrounding natural area,” Allison says. Hoping to include an outdoor gas fireplace, the couple came up with a genius space-saving trick of outfitting it with a ledge deep and low enough to pull double duty as a patio coffee table. Landscape architect Glen Gardner drew up plans around the idea, creating a bluestone courtyard that does a lot within a small footprint. And at the edge of the property, an evergreen hedge of podocarpus and azaleas eases the visual transition to the wilderness. “The plantings are tall enough to create a sense of enclosure while allowing the eye to take in the natural woodland beyond,” Gardner says.